Twelve years ago at a Vancouver airport lounge, a tall Prussian looking gentleman strode past me, carrying a four piece fly rod tube. At the time, I was carrying a six piece fly rod tube, so we started talking, as fly fishermen tend to do in out of the way places. 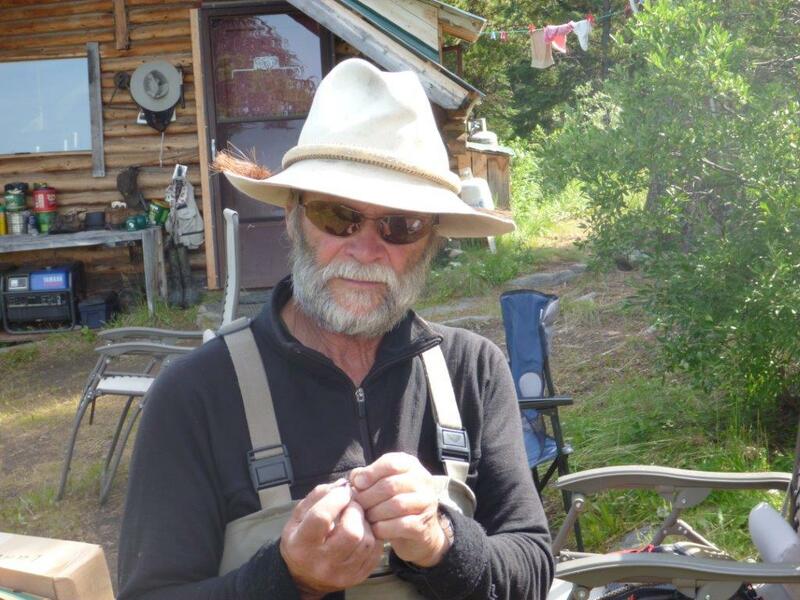 Herbert by then was in his seventies and had been on his annual visit to Spatsizi Wilderness Lodge, 300 km north of Smithers, British Columbia high up on the Spatsizi Plateau. 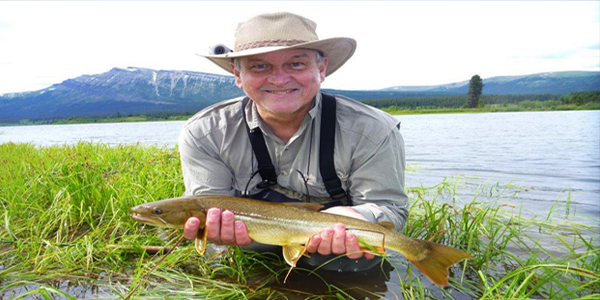 The plateau featured a myriad of interlocking crystal clear river systems, teeming with fat and wild rainbow trout, beautiful arctic grayling and cannibal bull trout. Fly fishing heaven. Guests could only get to the lakeside lodge by a commercial Otter float plane, which also brought in the weekly supplies of fuel and food. Every day for a week, Herbert had climbed up into one of the lodge’s smaller Piper float planes, scooting at low altitudes between snow-capped mountains before dropping down to a different lake and river, and catching and releasing up to 50 fish a day. He fly fished all around the world and Spatsizi was one of his favourite spots. I put it on the list. Now, 12 years later, I had just left Vancouver airport and was flying north to Smithers on an Air Canada Dash 8. The two men in front of me were speaking Swedish or German and reminded me of the rich cultural diversity of the Canadian west, where European ethnic and religious minorities came to get away from the majority and themselves became the new majority … but a more tolerant version. Then I noticed many of the passengers wearing lightweight quick drying clothes, fishing caps and then I saw the four piece rod tubes … I breathed a little easier … I was among my own kind. Part way down the peaks, the glaciers were collapsing under the summer sun, melting like brown and white turkey necks, down into the valleys, taking topsoil and vegetation under them. I took a look out the window …climbing to full height the mountains were black granite spires, with hard edges sharpened by millions of years of glacial drift, the peaks flecked by snow and cradling small fluffy clouds … I felt like one of the winch men on a rescue helicopter, getting lowered down into rough black seas with white caps and fluffs of spray, but still, as if captured in a digital freeze frame. And there, deep down in the mountain swell, very deep, lay some delicately braided rivers fed by snow melt – magic waters for trout and spawning salmon. At full cruising height of 7500 metres it was bloody beautiful. Now, at this point, I should tell you a little bit more about the residents of northern British Columbia. They breed em tough up there. Surviving winters at 40 degrees below freezing, surrounded by animals that see you as an ingredient, does tend to toughen you up somewhat. Counting the wolverines, wolves, cougars and three types of bears, I’d done some research on the sorts of animals that regard humans as finger food and the apex predator is the boar grizzly bear. They weigh up to 500 kg, stand up to four metres tall and can charge at 65 kph. They have claws as long as a man’s fingers which can rip a plane apart if they sense food inside. If the thought of meeting one of these critters concerns you at all, close your eyes as you arrive in Smithers airport, because there is a very large and very lifelike stuffed grizzly in a glass cage which was shot in 2001, about the same time I met Herbert. As a marketing ploy, I thought it was up there with having a stuffed white pointer at the Gold Coast Airport, but it was certainly memorable. I won’t forget it. This Grizzly, called the Hungry Hill Phantom, had chomped his way through 30 head of local cattle over three years and was shot trying to add two conservation officers to his menu. The officers saw him at 24 metres, trapped in a steel cable leg hold snare which was wrapped around a large tree. He had been chewing on the steel cable and when he saw the two men, he became enraged as only a boar grizzly can, broke the steel cable and charged them. He got within seven metres before the high calibre cross fire stopped him. Standing by the bear was our welcoming party or ‘expeditor’ a very nice lady who declined offers of assistance and effortlessly threw all our bags into the back of a small bus and whisked us off to the Hudson Bay Lodge. The night was young, so I checked out the guest directory and counted 12 different mainstream and evangelical churches, and almost as many gun shops. Off to bed then. Next day Thursday, we were finally loaded onto our turbo otter and away we went, with a French Canadian pilot called Wendell, a weeks’ worth of groceries and assorted hardware items and spare parts tied down by cargo nets around us. Everybody apart from me knew somebody on the plane and it was like heading off to summer camp for grownups, but with our very own plane. It was a real blast. 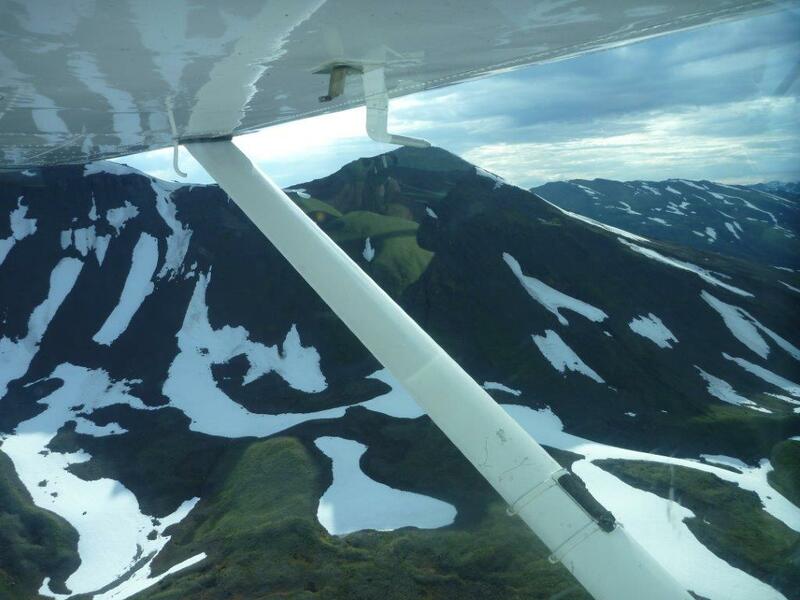 The scenery on the flight into Spatsizi was unforgettable. The lodge is in a saucer shaped valley, ringed by glaciated black granite mountains, flecked with patches of a pure white snow. Below the tree line was a Bristol green ribbon of Douglas fir trees, then more flat, olive green grassland with splashes of purple wildflowers. The lake itself was a pure processed blue and nestled at the far end were Spatsizi’s yellowed brown pine log cabins with their bright ferric red steel roofs. It was prettier than a box of crayons. The lodge itself was great. In this neck of the woods, a flushing toilet counts as a luxury and six guests shared two of those. Each guest had their own cabin, with private showers, log beds, and wood stoves. Meals were served in the main building that has a lounge area, fly tying bench and a pine dining table which seats up to 20 guests and staff. The chef provides fine cuisine, freshly baked breads, and homemade desserts. And in this neck of the woods, they eat a lot. After a lunch I had enough food on board to choke a fully grown goanna and I waddled off for an afternoon of fishing with our host, the legendary outfitter and patriarch Ray Collingwood. Ray is a small, wiry man in his seventies and very tough indeed. When he talks, the sentence starts out kind of slow and gravelly, a bit like an avalanche, grinding down a mountain. You tended to listen respectfully. Especially as he carries the bear bangers and pepper spray. That afternoon, I caught about six big rainbow trout, up to five pounds. There were also lots of what the locals call white fish, which were, funnily enough white. 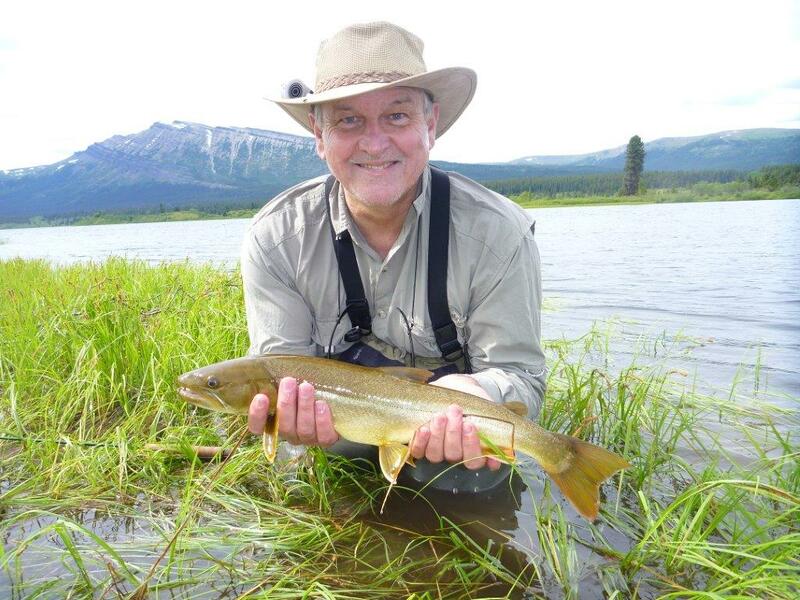 And one big, bad bull trout, which was actually an arctic char. 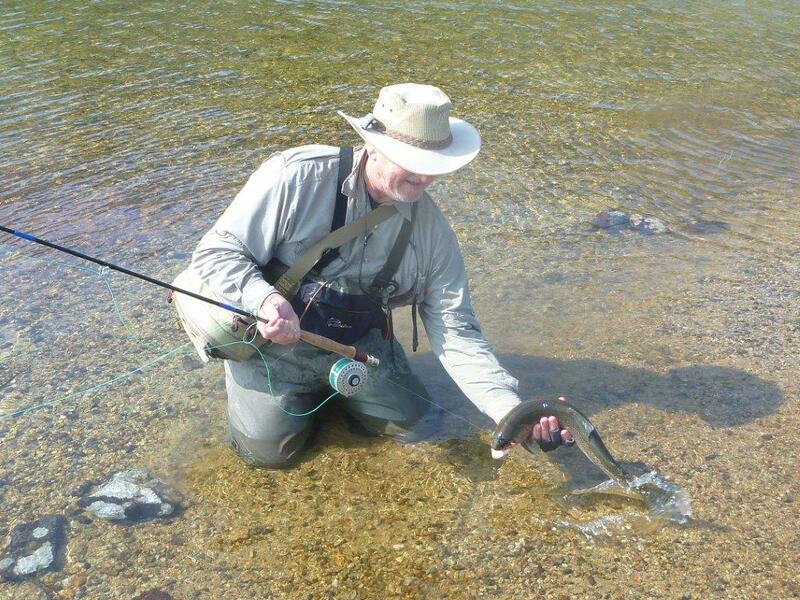 I had run across the bull trout earlier, chasing my rainbow trout after I had hooked them. The bull trout were attracted to the struggling fish and bit savagely at them while the rainbows were otherwise engaged with my hook and line. This began a frantic game of me trying to save the fish I wanted to catch and release, from a real life predator lower down the feed chain, which preferred to catch and eat. When I finally hooked one of these predatory monsters, it began with a soft nibble, like a white fish, but when I tried to pull it in, dived down and dug in, like a cranky old brown trout. When it decided to run, there was nothing I could do but give it line and trust in my knots. With a lot of side tension, the monster relented and decided to take a breather in some shallow water, where I was waiting. Then it was grip and grin and release and start again. I got back to the lodge and enjoyed a hot shower and cold beer, long with some comfortable company from the blokes in quick drying gear and a four course meal, accompanied by half a bottle of a very pleasant, understated red, from a nice US winemaker called Jim who brought along a case. See earlier comments about being amongst friends. After that, every day was a new adventure … we climbed aboard the little float planes and zipped in between the mountains, scanning for moose, elk and goats, before swooping down onto one of the 30 different rivers, lakes and streams. On Saturday, we fished Tatlatui Lake and it was the kind of fishing day you only dream about Australia or New Zealand. When we landed I was buzz bombed by three cm orange stoneflies, so on went an orange stimulator fly and then followed six hours of non-stop hits from some crazy rainbow trout. Instead of dead drifting dry flies, I was told to hold the line at the end of the drift and let the fly swing in a circle, creating a pointer shaped wake on top of the water. This runs counter to all the theory, but the guide called it the Spatsizi swing and it worked a treat. By the way, the guides also fly the float planes, which keep the costs down to about a grand a day and given our exchange rate this is better value than New Zealand at the moment. At the end of the day, I’d missed some 60 hits by trout, hooked another 20 and lost them, but caught and landed 41 beautiful big rainbow trout, all over three pounds … it was my best day ever on the water, in terms of numbers … about 120 hits in total over six hours on the water …one hit every three minutes … my life was complete. On Monday we visited Firesteel camp. Ray had flown in earlier in his little Piper float plane, with his new red dunny door tied to one of the floats and his favourite pooch as his fellow passenger. Firesteel reminded me of the cabins I love in the Victorian high country …except this one had more mosquitos, no flushing toilets, no solar panels and no electricity. The emergency skis leaning against the cabin were a couple of old sand shoes nailed onto metre long pine planks. Like I said, they breed ’em tough up there. Ray turned out to be a magnificent host. 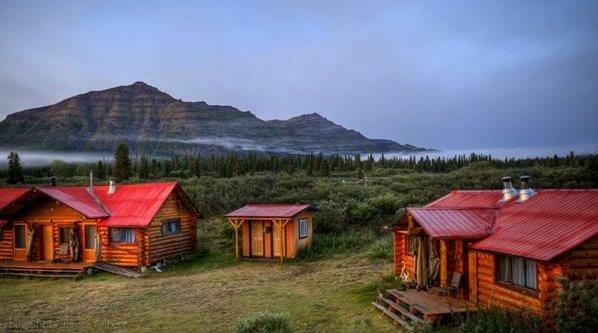 The moose steaks were delicious … the beds clean and dry and after dinner Ray lit a campfire and rasped out a few yarns about surviving black bear attacks and winters at 40 degrees below freezing point. He even produced a Cuban cigar from his root cellar. It was just like a cubby house for grown-ups. Or men who had never grown up. You can count me in there. Now I knew why Herbert loved the place. I’d like to have thanked him, but he died a couple of years ago, so you’ll have to take my word for it. Give it a try. It’s nourishment for the soul and we all need more of that.